KEY stakeholders of the ruling All Progressives Congress (APC), in the Southeast geo-political zone may have taken a bold step to address and solve all intra-party rancour and disagreements in the party, particularly in Imo, Enugu and Anambra states, ahead of the 2019 General Elections. The Nation gathered that the decision by chieftains of the party in the zone to put their house in order has also received the blessing of the new national leadership of the APC. The peace move, according to some of the stakeholders, is also expected to help find lasting solution to all forms of leadership tussle in the party in all the affected states, which are now bedeviled by leadership crisis and fictionalisation involving notable party figures following the numerous disagreements that trailed the last congresses of the party in affected states. It was gathered that though concerned chieftains of the party have been mooting the idea of a peace move, the idea was further cemented into something that must be done after the intervention of Oshiomhole and the new zonal leadership of the party, shortly after the national convention of the ruling party, about two week ago, in Abuja, the federal capital. While discussions are now centered on how successful the planned peace moves will turn out, observers of the politics of the region are unanimous in their positions that for the party to make meaningful impact in the zone come 2019; it must reconcile its warring chieftains. Rather than end the crises in the party across the zone as predicted by some of its leaders, the last congresses of the APC in the southeast further deepened the animosities within its ranks and files. Jude Ebelo is the Regional Director of Nigerian Voters’ Congress (NVC) in the southeast. He told our correspondent that an unending power tussle between founding members of the APC and other chieftains who defected from other parties to join the ruling party after the 2015 general election, as well as a fierce battle over who gets which ticket ahead of the 2019 general elections are the two major issues at the heart of the crises. “The APC in the southeast has decided very well if truly it is now searching for peace by reconciling its warring chieftains. At the initial stage, what obtained was a sharp division within the party’s leaders. But as we speak, in most of the states of the zone, what we have now are factions of the party. That happened after the congresses. And it is important that these developments are nipped in the bud. “In Imo, the governor is taking on the allied forces made up of nearly all other persons that matter in the party aside Governor Okorocha and his men. In Anambra, the Minister and other leaders of the party are not on the same page. In another state, a serving minister has been schemed out of the leadership of the party and he is crying blue murder if the situation is not addressed,” he explained. Not a few persons thought things cannot get worse for the APC in the east than it became after the congress. But that assumption turned out to be false. 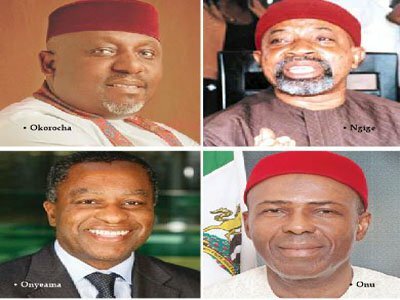 Barely a week after the party’s national convention, four members of the Imo State House of Assembly, all chieftains of the APC, were suspended, by their colleagues, majority who are also APC lawmakers. The leadership of the legislative house alleged that the suspended lawmakers are being punished for “unparliamentary conduct” among other reasons given for their suspension. But party chieftains and other observers say there is more to their suspension than what is being alleged. “Politics, and in fact, the animosity between the governor and other APC leaders is responsible for this new crisis within the party,” a party chieftain claimed. Among those suspended are the member representing the Imo Deputy Governor’s constituency, Ifeanyi Nnataonye; the lawmaker representing Senator Ifeanyi Araraume’s constituency, Isiala Mbano, Chiji Collins; Nkenna Nzeruo, Oru East and Uche Oguwuike, Ikeduru. 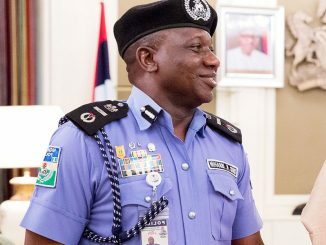 The suspension of Nnataonye and Collins, two well- known chieftains of the “allied forces”, is giving credence to claims of political persecution in the matter at hand. The allegation and the counter allegations that trailed it were the aftermath of the recently concluded ward, local government and state congresses of the party where the minister lost out. While the minister is alleging that he and many other party chieftains were sidelined in the processes that produced Nwoye and others as party leaders, the chairman said the minister lied. “On the unfortunate report attributed to the minister, you don’t create parallel structure by wishful thinking; congress took part in all 360 wards, supervised by INEC, security agencies. Under my leadership, we don’t do thuggery, we don’t encourage disorder, that’s what he is doing, Enugu recorded the most peaceful congress,” Nwoye said. But supporters of the minister are still insisting there will be no peace in the party until their grievances are addressed. 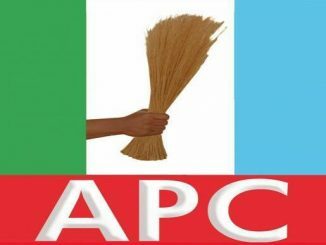 In Ebonyi State, the APC is still polarized into two as a faction loyal to Minister of Science and Technology, Dr. Ogbonnaya Onu, is being accused by another which had the support of the party’s governorship candidate in the 2015 general election, Senator Julius Ucha, of hijacking party structure for selfish reasons. Currently, the Onu faction has Pastor Eze Nwachukwu as its chairman while the Ucha faction has Hon. Ben Nwaobasi as its own chairman. Nwaobasi was elected the state APC chairman at the last congress of the party in 2014 while Nwachukwu was elected his deputy. But trouble reared its heads when some executives of the party announced Nwaobasi’s suspension and named Nwachukwu as Acting Chairman of the party in 2015. And in spite of the recognition of Nwachuckwu as the new State Chairman by the national headquarters, trouble is still brewing within the party in the state. 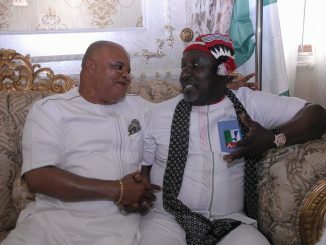 During the week, the crisis rocking the Abia State chapter of the APC deepened following the insistence of Justice Okoroafor of Abia High Court that his order sacking the newly sworn-in Donatus Nwankpa-led executive committee of the party in the state subsists, maintaining that Dr. Emmanuel Ndukwe remains the state chairman of the party. Justice Okoroafor said that until a higher court upturns his sack order, it remains valid. Trouble started with the holding of two parallel congresses by factions of the party in the state last May. In Anambra State, a group within the party is still insisting that the last APC state congress was hijacked and didn’t hold. One of the aggrieved party chieftains, Donatus Okonkwo, had urged the party’s leadership in Abuja not to believe any story to the contrary, alleging that the congress was a total charade which will be strongly challenged. According to him, some individuals within the Anambra State chapter of the APC are planning to hijack the party structure in the state. “It will be shameful if any delegates’ list and elected people come out of last Saturday’s exercise in Anambra. “The cooked up names and crowning of individuals led by Dr. Chris Ngige, George Moghalu and Tony Nwoye is nothing but masquerade dance in market place as they think they will take the people for a ride,” he said. And in spite of efforts to douse the tension raised by the controversial outcomes of the congresses, many chieftains and members of the party are still bitter. In a bid to quell the many crises bedeviling the party in the zone, the APC has set up two reconciliation committees. While one committee is charged with the responsibility of addressing the crisis in Imo State chapter of the party, the other would undertake similar assignment for the entire zone. According to Governor Rochas Okorocha, who made the disclosure, the peace effort was required to prepare the party to face its challenges and achieve success in forth coming elections. He said Senator Omezue Azu Agboti would chair the APC Peace and Reconciliation Committee, Prince MacDonald Akano heads the committee charged with reconciling warring factions in Imo State. “What is important now is that we must make all efforts to make the party move forward both in the Southeast and in Imo in particular. This is not the time to point who is your political enemy or not. The party will no longer condone any act of indiscipline, stealing of result sheets and carrying of ballot boxes. APC is not known for that,” he said. Okorocha hinted that the July 14 council poll would still go on and urged eligible voters to endeavour to participate, adding, “The local government elections will still go on as scheduled and I hope everyone will participate and the exercise will be free and fair. The issue of the Coalition has come to an end. The people had spoken and God has heard them. We are back from the national convention with victory,” the Governor added.